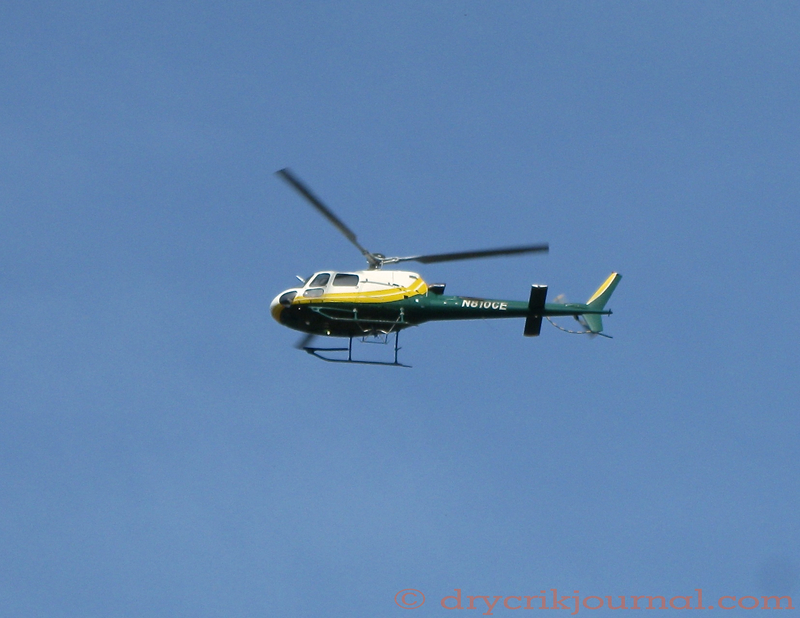 Followers of this blog may recall the February 26th “Good Guys, Bad Guys?” post regarding a helicopter circling low over residences and spooking livestock in the Dry Creek Canyon. The helicopter visits continued for several days thereafter until I went to the FAA site online and then contacted the Tulare County Sheriff’s Office. I didn’t follow up on this event in this blog after speaking with an apologetic representative from Southern California Edison who had contracted the helicopter and pilot. Two miles west of Dry Creek, SCE was installing a controversial high voltage transmission line. I was told by the representative that they were looking for Golden Eagle habitat, as a pair of Golden Eagles had built a nest in one of their towers that shut them down for a couple of months. Concentrating helicopter time in the bottom of side canyons and circling over residences, two of which are off the electrical grid, made this explanation fairly hard to believe. Or, had they found evidence of Golden Eagles, would they then condemn private property as mitigation for the public good? I concluded our phone conversation with my displeasure with SCE’s failure to notice any of the property owners and the irresponsibility of actions that jeopardized our livestock business and frightened our horses. No further flights since. But is this corporate ignorance or are big companies like SCE accustomed to disregarding the rights of others? I’ve long been a flag waver for free enterprise where people can improve their lot in life with hard work and a little luck, but if powerful corporations have become the epitome of a Capitalistic philosophy that has now embraced the planet, perhaps we need to rethink our values. Big isn’t always better. Furthermore, just because a corporation is headquartered in the USA, doesn’t necessarily mean it’s American owned, that the majority of its stockholders are US citizens, or that the majority of its stock is held by US investment houses. After yesterday’s post, I couldn’t ignore the echoes. Maybe the warm weather is making me irascible.